Jofra Archer ripped out the cream of the Essex batting on his Specsavers County Championship debut for Sussex on the opening day at Castle Park. The former West Indies Under-19 pace bowler claimed the prized scalps of Nick Browne, Tom Westley and Dan Lawrence, the first two in successive balls, two days after he signed a contract through to end of the 2017 season. Archer, 21, had been rewarded for taking five wickets in the Royal London Cup against Somerset at the weekend. He mixed variations of pace and bounce, disguised by his smooth, rhythmic run-up, to finish his first day in English red-ball cricket with three for 74. However, Archer was largely unsupported as Division Two leaders Essex rattled up 337 for six after opting to bat with four batsmen reaching half-centuries, but without moving on to three figures. Ryan ten Doeschate top-scored, but he was fifth out in the late evening for 83 from 124 balls. The Essex openers, Browne and Jaik Mickleburgh, had put on a century stand when they were parted straight after lunch. Browne had just reached his fifty when he edged to the wicketkeeper to give Archer his first Championship wicket in the second over after the break. Browne had been particularly belligerent in the morning with a flurry of boundaries on a lively track, cutting several boundaries square of the wicket, hitting others straight and even hooking Australian paceman Steve Magoffin for another. He reached his half-century from 99 deliveries, with 11 fours, but faced just four more balls, with one more boundary before he fell. Archer did not have to wait long for his second wicket. The very next ball he dropped one short to Westley, who tried to fend off a delivery in front of his face. The ball, though, came off a combination of helmet and glove and rose so high that Harry Finch had time to run round from third slip to pouch close to the stumps. The absence of Ravi Bopara, who was reported to be ‘unwell’, meant Lawrence was elevated a place from his usual No5 batting spot. He put on fifty for the third wicket in 12 overs before Mickleburgh pushed forward to a particularly rapid ball from Magoffin and missed it completely. Mickleburgh, who was playing his 100th first-class match, had looked pretty secure up to that point, though he had reached his 125-ball half-century with an involuntary snick through the slips off Chris Jordan. Lawrence became the third Essex player to fifty when he effortlessly pulled Jordan over square leg for six. His was the quickest of the trio, getting there from 75 balls with eight fours in addition to the maximum. Lawrence did not advance much further beyond his third half-century in three games either, top-edging Archer and skiing a catch to Luke Wells at short cover for 65. He had put on an entertaining 83 in 22 overs with ten Doeschate as the pair scampered busily between the wickets. The Essex captain was next to fifty when he deposited Archer through the covers for his fifth four, the milestone reached in same number of balls as Lawrence. James Foster helped him put on 77 for the fifth wicket, the wicketkeeper once pulling Magoffin over midwicket for six. 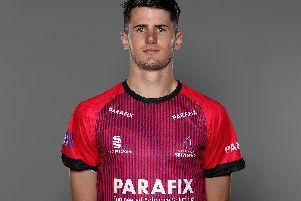 Ten Doeschate, who had carved out seven fours, had a life on 81 when Danny Briggs failed to hang on to a catch at first slip off Jordan. But it only cost Sussex two runs as he was bowled shortly after by Magoffin. Foster followed in the penultimate over of the day, lbw to David Wiese for 42.